Some Thoughts on Crunchyroll’s 2016 Anime Awards Before Voting Begins – Nigorimasen! Crunchyroll launched its inaugural Anime Awards in late December with nominees in 14 categories selected by a panel of seven judges with different backgrounds. Voting begins January 3rd and lasts one week until January 10th. The winners in each category will be revealed soon after voting concludes with one exception: Anime of the Year. The winner for that award will announced live at a party in San Francisco on January 28th. Subjective awards are often full of debates about who or what should have or should not have been nominated. I’m not going to discuss the merits of any particular series in this blog post, mainly because I have only seen episodes from two anime that received nominations – those two are Flying Witch and Space Patrol Luluco. I’m more critical of the overall categories and gaps in the types of anime series being highlighted. Some categories look like they were possibly inspired by the MTV Movie Awards like Best Boy, Best Girl, Best Couple and Best Fight Scene. There are three genre-related categories with Best Action, Best Comedy, and Best Drama but what about shoujo, slice-of-life, horror, science fiction, sports and other types of stories? The only category focused on the work of making anime series is Best Animation – no character design, art direction, or writing categories. I would like more of the people involved in creating nominated series to have their names listed on category pages. Animation production studios and director names are present alongside nominees in non-music categories; song titles & performers are shown for nominees in the two music categories, Best Opening & Best Ending. However, voice actors (Japanese, English or otherwise) are not mentioned in any character-focused categories. I don’t expect more technical categories like storyboarding, editing and art direction to be introduced in future years of these awards but I *would* like to see more variety in which areas get attention when categories are decided upon. 19 different series received at least one nomination and 10 anime series received multiple nominations. There were more than 100 anime series that were simulcast through legal channels in 2016; almost all of the nominated anime are available through Crunchyroll or Funimation with one Amazon exclusive (Kabaneri of the Iron Fortress) and no Netflix exclusives. Most were popular in online conversations and only one (JoJo’s Bizarre Adventure: Diamond is Unbreakable) was a sequel to a previous anime series. I am interested to see how well the voting process functions and if there will be any restrictions to discourage ballot stuffing such as allowing only one vote per IP address. 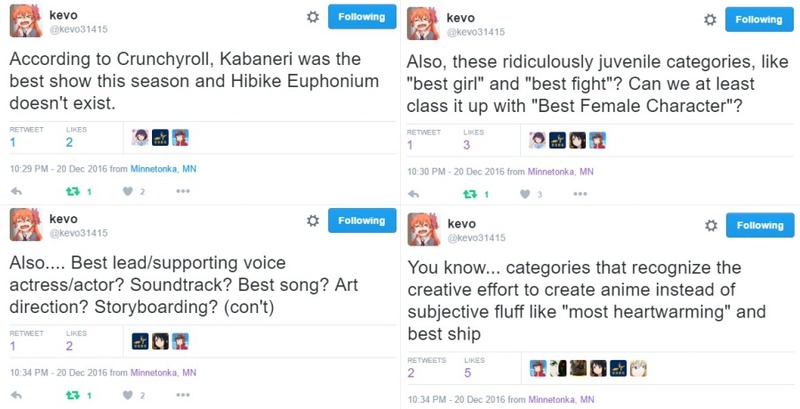 I hope that Crunchyroll’s awards rollout goes off without a hitch and that post-awards feedback is taken into consideration when they plan their 2017 awards. Tagged 2016, Anime, Anime Awards, awards, Commentary, Crunchyroll. I would be more interested in this, but it feels like a crappy VGA sort of thing, as a marketing boost for their back catalog. The worst part I think is that opening it to fan voting or having a more transparent process help people who care and the general anime public engage their content more, so instead of that they namedrop a few people and listed the same shows over and over again. The fact that they left out clearly better entries in some categories for the same repeated nominations is just salt on wound.